noun: womanhood •	the state or condition of being a woman. •	the qualities considered to be natural to or characteristic of a woman. •	women considered collectively. 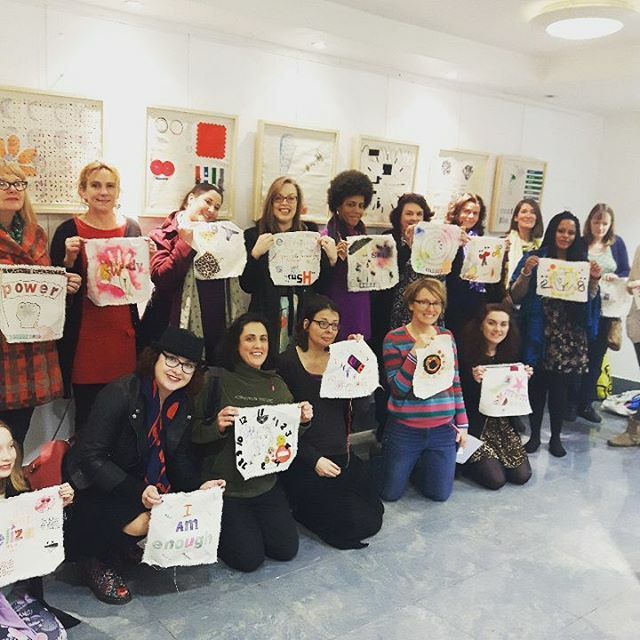 This workshop invited contributors to consider their role as women, & using different craft methods, they were guided to visualise their interpretation on canvas. They moved from station to station experimenting with different materials & techniques, from stitch to print. They worked alongside other women in a collaborative, discursive way exploring themes affecting women around time, cycles and responsibilities. The two hour workshop was inspired by the relay nature of the exhibit: "Womanhood", by M M M (a group of women Making Monthly on Mondays). This was part of the SheFest She Art of Now exhibition hosted at 35 Chapel Walk Gallery, Sheffield.